A traditional clay nativity scene. There is a lot of talk among many circles of the nature of many traditions in many Christian holidays. What does a fat man breaking into the homes of tiny children have to do with the baby Jesus? Did baby Jesus have a Christmas Tree? Does the Easter Bunny summer with the Reindeer in Aspen? Many say that all of these are proof of our pagan traditions, and that the Christians are pagan for following them. Many would also like to believe that the entire holiday is nothing but a huge collection of things to make us buy more things. I however have been digging around and believe I have discovered some things that many may find surprising, enlightening or entertaining about the delightful if sometimes confusing traditions of our favorite holiday. One story I sadly remember is of my nephew. When he was three he informed us that Santa Claus wasn’t real. His daddy told him that, (please read with a white trash accent) “We don’t worship pagan symbols ’round here.” Well as the good uncle I sat my nephew down and reaffirmed to him that no, Santa Claus was not a pagan and he is indeed real. Santa Claus – Can he be trusted? Yes he can. Santa Claus: Santa was indeed a real person. He actually did go by the name of Nicholas, his Greek name when he was a monk in the early Christian church around what is today Myra, Turkey. He lived in the 300’s and became famous for his great acts of charity. (At least he was real, but don’t tell the kids.) One story speaks of him giving dowries to three young, pious, impoverished girls so that they could be wed, and not go into other forms of lifestyle. Another speaks of him saving three wrongly prosecuted men from being put to death. For these and other reasons he was made a saint in the church. In his native home of Myra there is the first church dedicated to Saint Nicholas and many more have risen in Europe since the 7th century. He is also considered the patron saint of children and many others. His uniform is also of Christian decent as it is an evolution of the canonical robes worn by later Christian cardinals. How all these turned into breaking and entering to give presents in return for good deeds and tasty treats I can only guess, but I can promise you children that Santa Claus is real. So be good for goodness sake. December 25: I am sorry folks, Jesus was not born on this day. Many agree that it fell sometime around the spring, probably around April or May. Some accounts I have read also place it in early January. The Bible was not clear on this and, in spite of the fact that his entire of family was Jewish, there were no good records for the exact time of his birth. What most biblical scholars do agree on is that it was not December 25th. 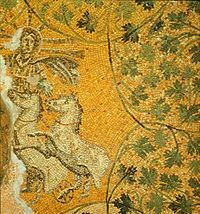 Jesus Christ fulfills the role as “The unconquered Sun” a tradition of solstice in fourth century Rome. In any case, these holidays all fell close enough to each other and held a strong enough pagan tradition that in the 300’s the early church set a day when we as Christians would recognize the birth of Jesus. This allowed the influence and meanings of the pagan holidays to gradually fade away as their traditions began to become part of Christmas as we know it. The Christmas Tree: This story is more interesting than you might think. It turns out that this tradition may technically have descended from pagan roots, but there is more to this story. The Christmas tree that we have today probably came around the end of the 1700’s around Germany. At that time the German Christians were really reinventing the holiday at that time, not in my opinion to do anything wrong, just to add some culture and something new to the celebration. They started erecting Christmas trees with decorative candles (and I don’t know how they didn’t burn down the entire place with open flame on a dried out tree in the middle of the living room.) This is also where we get the traditions of tree ornaments and Christmas lights. Once these traditions started in Eastern Europe they began to spread to the rest of Europe and eventually to the Americans through immigrants, most likely the Dutch. But where did the Germans come up a tree in the living room? There are two majors beliefs as to the origin of the Christmas tree. One is believed to be around a play in which the “Paradise Tree” stands as the centerpiece of the play featuring Adam and Eve in the creation story. The other story (which I like better as it tells a richer, fuller story) is about how the Christmas tree is descended from some of our ancient ancestries. This is where some pagan roots to the tree story start to show. In many Norse, Gaulic and ancient Germanic religions, trees were key figures of their religion. 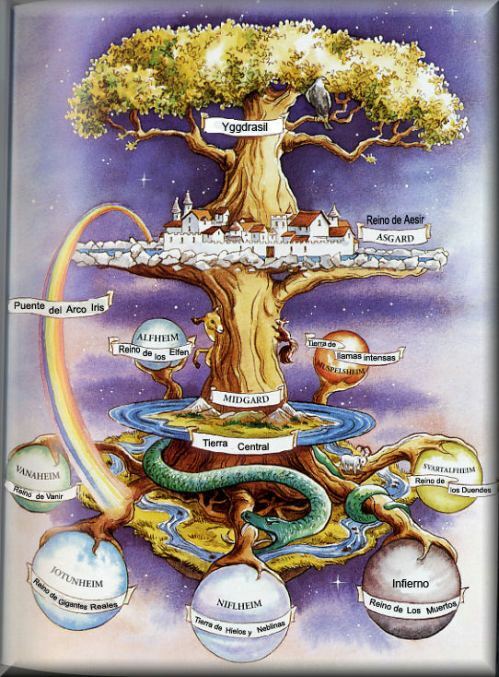 To the Norse the holy tree of Yggdrasil held up the entire world, which consisted of many realms included the realm where the gods lived and where humans lived, as well one for the elves, dwarves and their own version of Hell, which they called… Hel. In any case, trees were an important part of these religions and the cultures of ancient Europe, particularly France, Germany, Western Russia, Scandinavia and England. Where this becomes a Christian story is here. Bonifacius brings down the Donar Oak before the Chatti. In the early 700’s a Catholic Monk named Saint Boniface (Bonifacius) did much work to convert the Germanic tribes of Northern Europe. One legend speaks of him traveling to a city of the Chatti, a Germanic tribe. There he found a mighty tree called the Donar Oak, which to the people there, symbolized their patron god. Well Boniface would have none of that and he felled the tree (along with the Frankish troops who protected him from the angry savages.) According to legend this tree was used to build a chapel to Saint Peter and was the birthplace of the Benedictine order. You will also see images of Saint Boniface with an ax, a reference to this popular legend. This may sound strange, but it makes perfect sense for a Christmas story. If this legend is truly viewed as the beginning of the Christmas tree myth then it represents something much deeper than a tree. When Saint Boniface went to Germany he went to spread the news of Christianity to the pagans. By felling the tree his action symbolized the arrival of Jesus and the death of the pagan religion in Europe. For that reason we can say that the Christmas tree is a very good symbol of Christmas as it stands for a subtle reminder of our pagan roots giving way to Christianity when Jesus was born. Reindeer, the North Pole and the Elves: I don’t have a clue. My best guess is they are just plain pagan. You just can’t really justify those. Deer are important for many of the Norse legends and a symbol of Odin (also considered to have some relations to the modern Santa myths.) And the elves are Norse myths as well. At least these little guys are cute and kind instead of the eternal hunters of man that the ancients made them out to be. The North Pole… well I guess they chose that because only recently have we been brave or dumb enough to go there and prove it wrong. In any case, these are all northern traditions, along with the holiday commonly known as Yule (hense Yule time.) It would make sense that since they were the last regions to come into Christianity before they started keeping good books of what is and isn’t Christian, that many of their myths made their way into Christian traditions. Don’t worry though, these aren’t a big deal anyway. What I hope you gained from this article is a few insights on things most Christians never think about (or tried not to think about because it may have led to places they didn’t want to go.) By studying the histories however, we can learn a great deal about our traditions that reestablishes some of our favorite merry making activities as authentic Christian activities. When my children are young I plan to tell them to leave cookies for Santa (who favors my wife’s chocolate chip) and when they are older I will tell them about what the real Saint Nicholas did for the people of his village. We will also decorate the tree and when they are older I will tell them about how Saint Boniface taught the Germans about Jesus and how he started the Christmas tree tradition. They will also place stars on the trees, sing both the secular and Christian Christmas songs and go to church to see the plays. I also hope that readers consider this. What symbols, acts, decorations or traditions are yours these Christmas holidays, it matters less about where the tradition comes from and more about what it means to you and those you celebrate it with. Doing something that may have been similar to something done by people dancing around a fire fifteen hundred years ago doesn’t make you a pagan. And these traditions we now celebrate are now important to our culture and heritage. So don’t get caught up and worry too much about what everything in the holidays may or may not have meant, but just enjoy the traditions of your special holiday. Also see other posts about the holidays at the Christmas Discussion. When celebrating Christmas, and our mind and heart are not focus unto JESUS rather to Christmas “myths” and merry making alone, we are still living in Idolatry and continues practicing pagans belief, we cannot give glory to God. It is not bad to celebrate Christmas or the birth of our Lord Jesus Christ even the exact date of His birth is not known if our heart and mind are praising Him for who He is and really thanking Him for what He have done in our lives and our families. Merry Christmas! Elesio, I am having a hard time understanding this post. I am really concerned that you did not actually read the post in its entirety before making this reply. Of course I am not going to say that the Bible is wrong, but I don’t agree with how you are using it. I feel my post is intended to bring the Christ back into Christmas, as so many Christians have hoped for for so long. It is meant to make things that exist as part of the Christmas holiday something that Christians can be proud of again and identify with their religion, as opposed to what many do now of guiltily doing it without knowing why while secretly worrying if what they are doing is paganistic. I am not sure if your definition of pagan is correct either. Paganism (from Latin paganus, meaning “country dweller”, “rustic”) is a blanket term, typically used to refer to non-Abrahamic, indigenous polytheistic religious traditions. These include historical religions such as Greek, Roman, Egyptian, Norse and Celtic religions. Pagan does not mean against Christianity. It has it’s own rituals, rights and icons, that are mutually exclusive to those of Christianity. Therefore, recognizing Christian figures such as St. Nicholas or St. Boniface for their works in Christianity actually brings us closer to the faith itself and because they are Christian, they can not be pagan. I feel that by doing this Christian’s can take part all in Christmas traditions while still recognizing Christ. I thought I made that clear. If I understand you however, what your advocating is that no ritual that is not completely focused on Jesus is wrong. With this I site marriage. A marriage is a religious ritual (for Christians) that is not exclusively focused on God or Jesus, but is focused on the couple’s bond. If you are saying that giving some attention to the other member of the ceremony is wrong than we have voided the entire point of such a ritual and marriage. What rituals are for is to remember the important lessons, rules, rites and culture of a group. Some rituals and traditions need to be remembered to preserve our history, even if they are in commemoration of people and events that happened after the events of the bible. Christians, particularly Protestants, are especially lacking in this since. We have forgotten the important leaders and history that has taken place since the Bible and now we are suffering from the confusion and dilution that accompanies such a loss in culture. Holiday traditions that the people can enjoy and use to pass on the acts of heroes of the faith and its values and Christmas is our most important. Besides that, you kind of just need to relax. I have a friend who has also researched into St. Nicholas. Some historical accounts have him present at the Council of Nicea which was convened to discuss the deity and co-eternality of Jesus as part of the Trinity–God the Father, Son, and Holy Spirit being co-equal. It is reported that as Arius asserted the heretical teaching that Jesus was less than God the Father, Nicholas became so agitated that he crossed the room and slapped Arius across the face! Thus we can assert that the real St. Nick upon whom our modern Santa Claus is based was an ardent defender of the orthodox view of Jesus Christ as fully God and fully man. Scott, thank you very much for this reply. To add credibility to Mr. Gordon, he was my youth minister when I was younger and also performed the marriage between my wife and I nearly a decade ago (feeling old yet Scott?) He is now a full minister over his own church and has been in the ministry for two decades. If you liked this article and respected my opinion, then you respect this man who I count as I one of my first mentors. Thanks again for your input Scott. jonathankdavis1, I thank God through your life, I read your article twice and appreciate it, you have a nice research. I just cleared some points for us Christians need to remember and you got it “no ritual (service) that is not completely focused on Jesus is wrong” that is what “Isaiah 42:8” means, that is not what I mean, it is what the scripture says. Often times many Christians doing unnoticed, worshiping the creation not the Creator, and it is the clear example of paganism, and you have knowledge about paganism i perceived, and giving worship to anything above God is Idolatry, and I believe you knew it. I’ll give one example from being a child: the mother or his/her father instructed the child to hang his/her socks near the window because Santa Claus will pass by to put candy inside of it. When the child was on sleep the mother or father will put candy inside the socks. And in the morning the child found out the socks full of candy, and he/she thought that is from Santa Claus. Where is the truth? The child idolized Santa Claus because of his/her parents lies. Where is Jesus in the scene? I believe the author of marriage is God from the beginning, Genesis 2:22-24, Matthew 19:4-6, and we cannot deny, God must be the center of marriage, and in every aspect of our lives as a whole, in the name of Christ. Marriage is also a metaphor for us Christians in uniting with Christ our saviour, as a collective body of Christ we are called His bride. Very well Elisio. In my family however will use Santa and the tree to keep our children interested in Christmas. It is clearly evident that children are psychologically prone to selfishness and not capable of understand the deep nature of what Christmas means. For that we entertain them with stockings and stories of Santa when they are five. This makes them learn to love the holiday and receptive of it’s message when they are older, wiser, and capable of understanding the true meaning. It is also important that we use these rituals to remember all the aspects of Christianity, like how a monk helped the poor as the Bible teaches and the other things he did, or how another monk traveled to a dangerous pagan land and taught them about Jesus. This is what made my people able to hear it many years later. This history is important, because it reemphasizes Christianity. Now this is an interesting read! Great post, Jon! I think that we can enjoy the merriment of Western Christmas traditions, while still honoring and remembering Christ. You addressed that well in this post!! Well done I was not aware of tree story. I always attributed the Christian’s takeover of the Pagan holidays with their own tradition to being obedient to Jesus command to “Occupy til I come” . Once we add our own celebration to the mix, the others eventually fade away.